The outrigger canoe of Tobi is closely related to that of Sonsol, the nearest island inhabited by Micronesians. In the Hamburg Museum fur Volkerkunde is a splendid model, from which the present description is made. 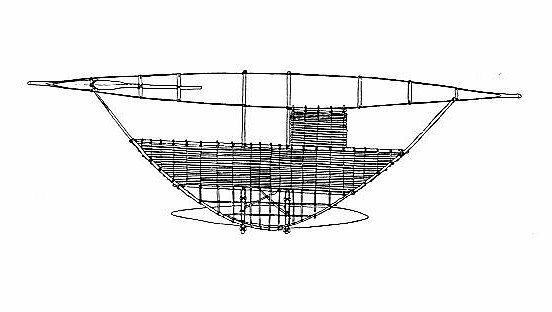 FIGURE 279--Outrigger canoe of Tobi, plan and cross section (Hamburg Museum fur Volkerkunde). The hull in general form approaches that of the Sonsol canoe, but the upturned ends are stouter and terminate in blunt knobs. 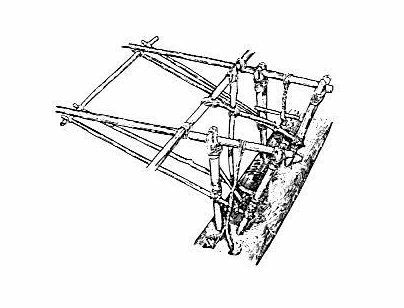 It is made up of a deep-sided, round-keeled dugout base, provided with a narrow and irregular washstrake on each side and two end pieces lashed upon the extremities of the dugout (fig. 279). FIGURE 280--Details of outrigger attachment of a Tobi canoe (Hamburg Museum fur Volkerkunde). The outrigger and its platform are also very like those of Sonsol. Each of two stout booms is connected to the rather short, sharp-ended float by means of two Y-crutch stanchions and a cord brace. No yoke to which the stanchions may be attached is present, so instead the lashing is carried around that part of the boom lying between the two crutch heads and thence down to the flat where it is rove through the usual V-shaped hold. A Spanish windlass, an ancient device widely spread throughout the eastern world, from southern India, Ceylon, and China, to the Marquesas and the Society Islands, is used to tighten the cords. A pair of obliquely running rods, forming side stays, strengthens the connection of each boom, one rod passing inward from each side of the Y crutches to attachment to a longitudinal stringer lashed below the booms exactly as in Sonsol. The units of another pair of rod stays cross one another between the booms, their lower ends attached between the points where the side stays are lashed to the stanchions, their upper ones to a stringer at the outer edge of the covered part of the platform (fig. 280). The platform is semicircular rather than triangular, the oblique spars from each end of the hull curved instead of straight; their distal ends join midway between the ends of the booms as in the modern Ponape canoes. The platform is stiffened by two stout longitudinal stringers placed respectively at about one third and two thirds the length outboard of the booms. The space between them is covered with a light decking of closely lashed rods, also present in the Sonsol canoes. FROM A.C. Haddon and James Hornell, Canoes of Oceania. Honolulu: Bishop Museum Press, reprinted 1975. Pages 389-390.